Hmm... I think I need a bigger gun. The great experiment continues with the Great Elk. 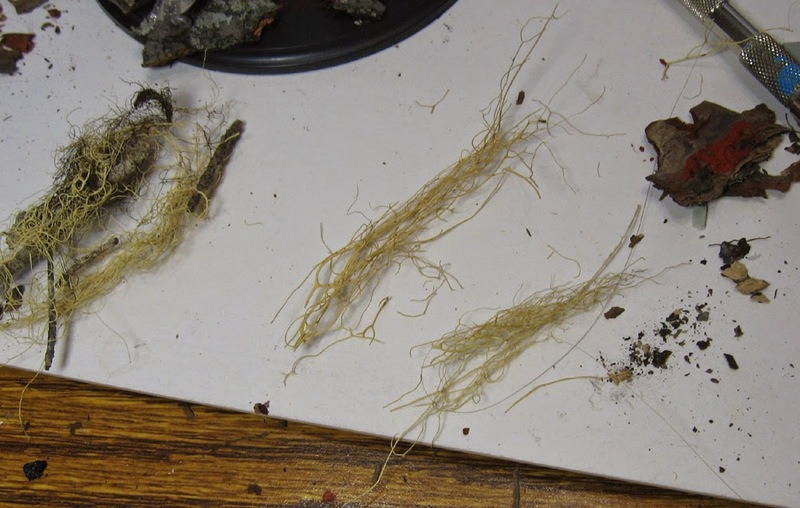 I was looking through some of the dried foliage that we had gotten many years ago, and noticed this. I had been using some of it as long, dried grass... like sawgrass, but I noticed that it had the potential to also act as those viney tree roots. It's not super easy to get these things pulled apart, as there is some breakage involved. It has the texture of dehydrated lichen in some ways. 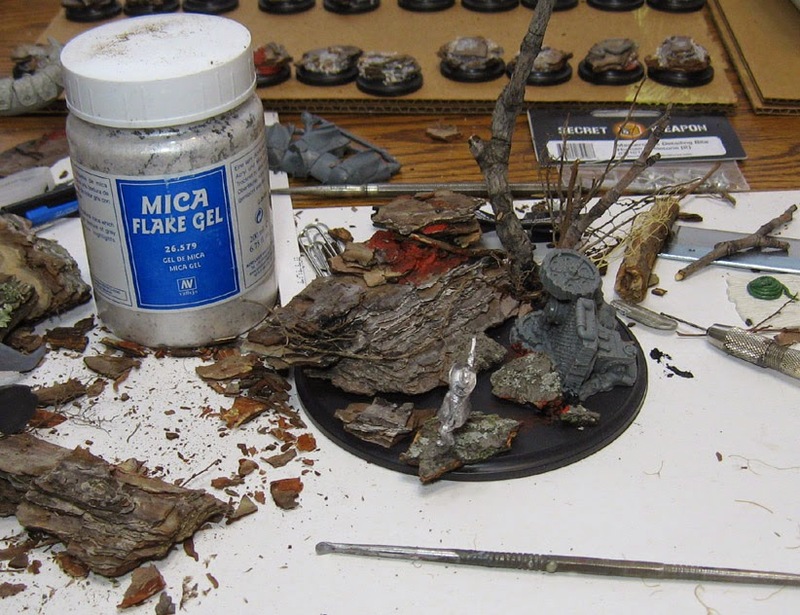 Like the other giant base that I created, I wanted to use some mica flakes as filler. This can look like many different things, depending on how you apply it. 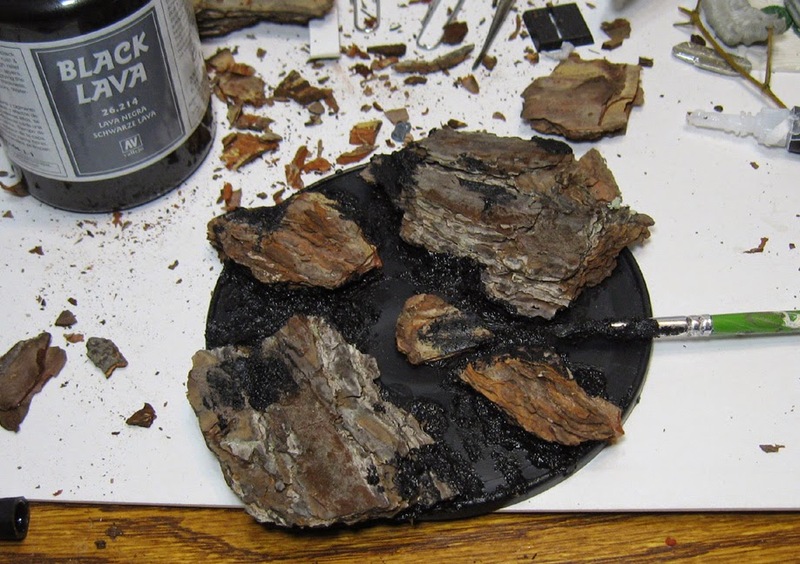 It can be fungus growths on trees, even a little bit like the shale rocks (aka bark). Again, it all depends on what you are applying it with. 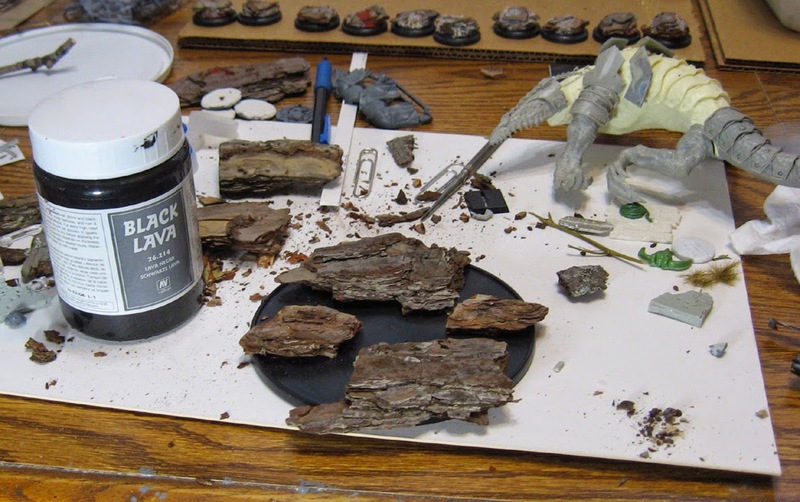 The sculpting tool in the foreground was used to apply larger amounts so that it wold be like rocks. Large areas are now filled in. 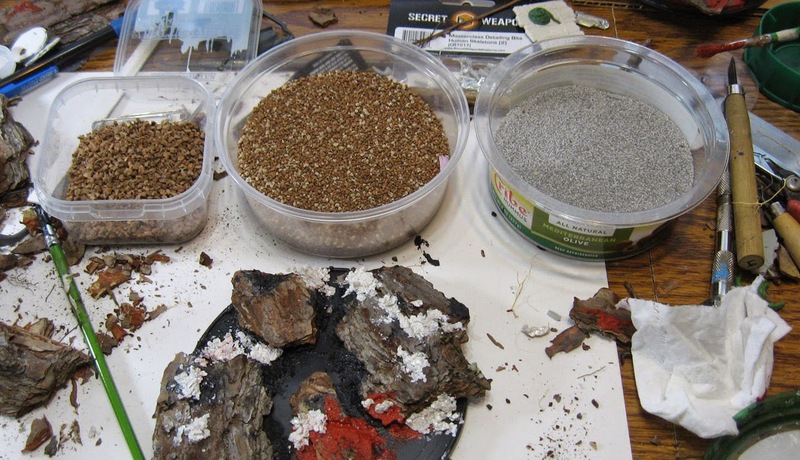 If you have seen previous articles on the use of mica flakes, you know that I like to use them as dried foliage! Oxide paste is applied on top of this, which adds a little different texture, and a whole lot of structural integrity! It dries like concrete, and that's what will be needed to support the weight of the Great Elk. The mica flakes were used as mossy growth on the rocks. 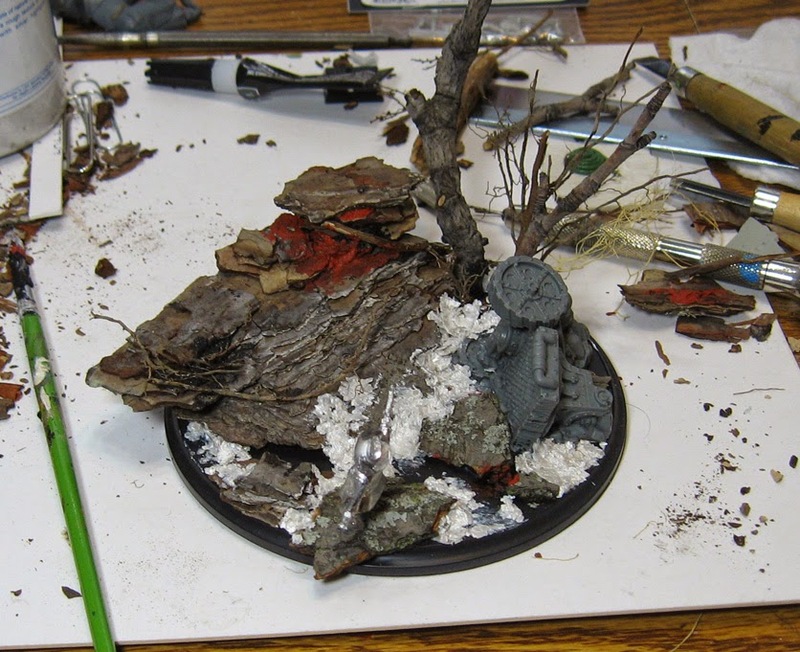 I will be applying many layers of water effects on this, just like the giant octopus base. Now it's that time again...gravel! As usual, 3 different scales of heavy, medium and light. 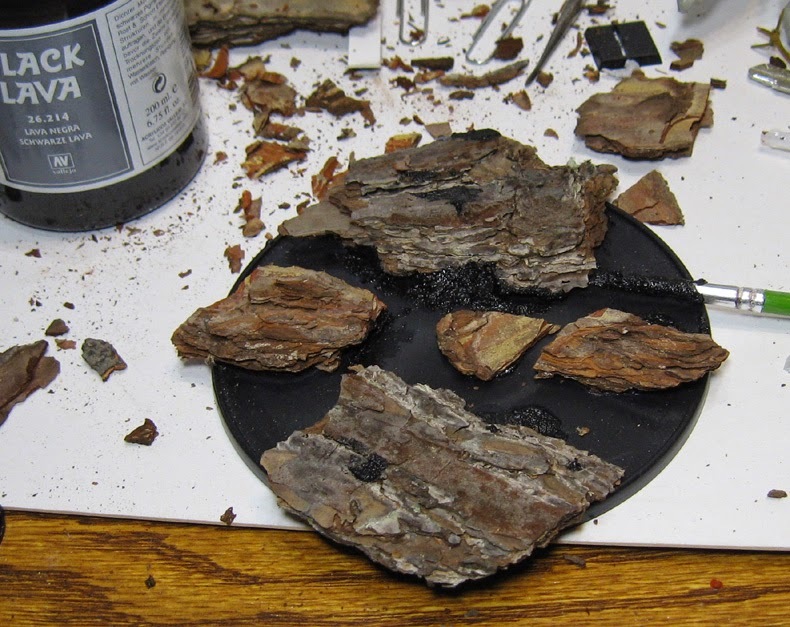 After the elmer's glue is put in place, I start by positioning the larger rocks, followed by medium, and so on. 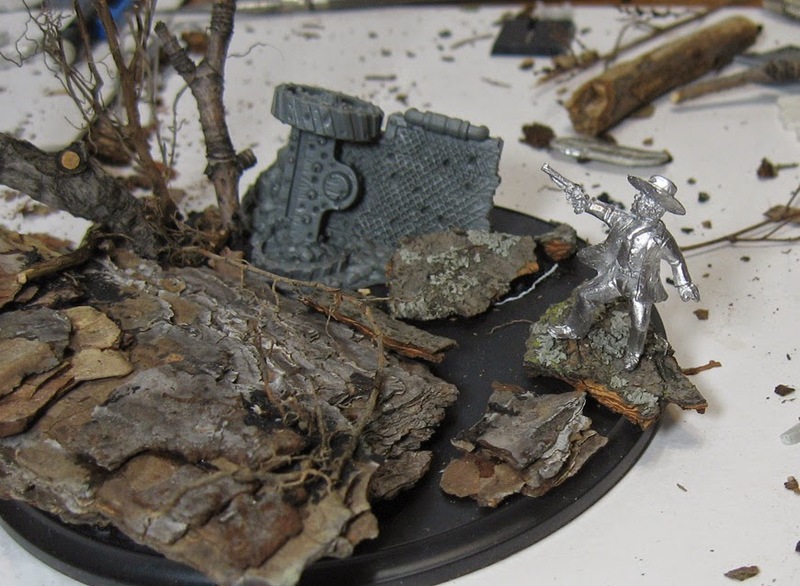 This many look like a mess right now, but all the elements I wanted are here... rocks, ruined vehicle, gun toting guy, trees, skeletons, and more! When it comes to height, that's not much of an issue, as there are not a whole lot of things he could hide behind! He's already bigger than just about every building we have. 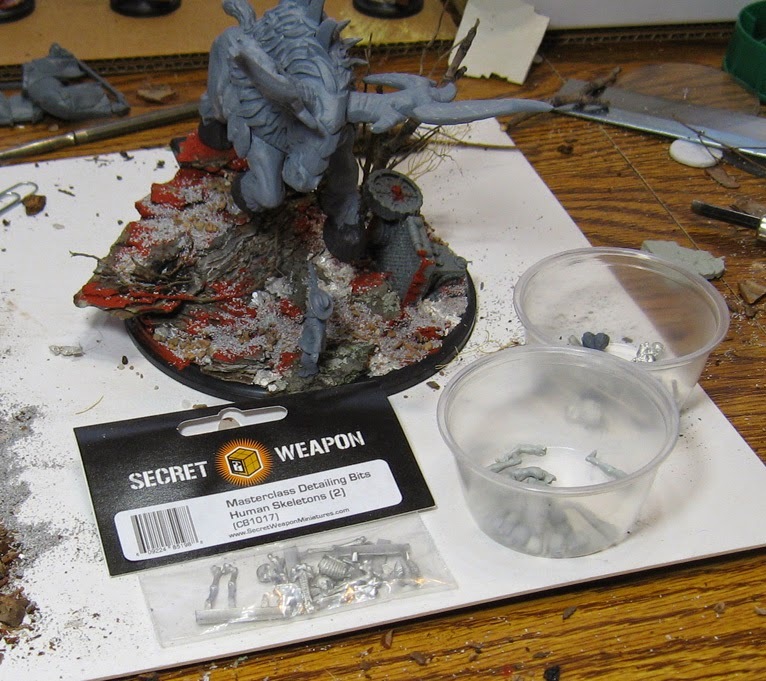 Stay tuned for the next few posts, which will show these massive bases going through the painting process! 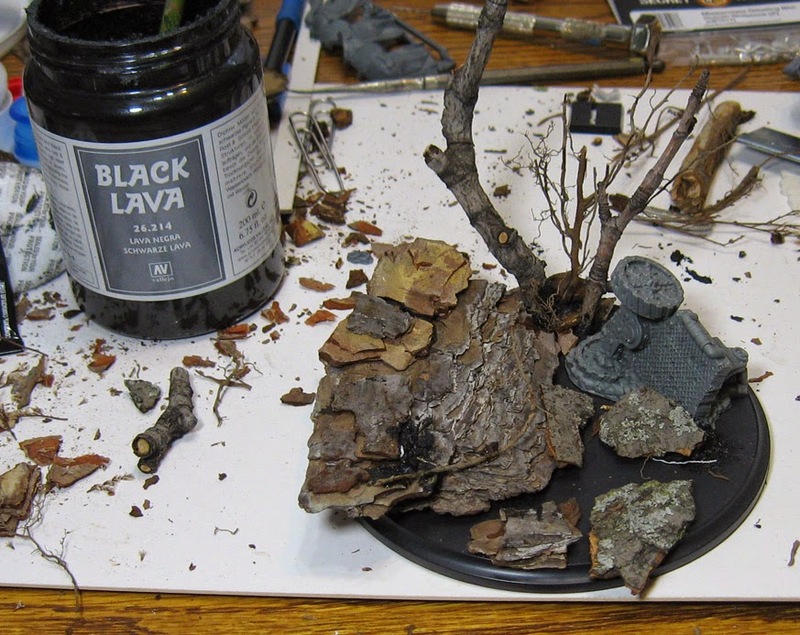 Monstrous basing for monstrous monsters. 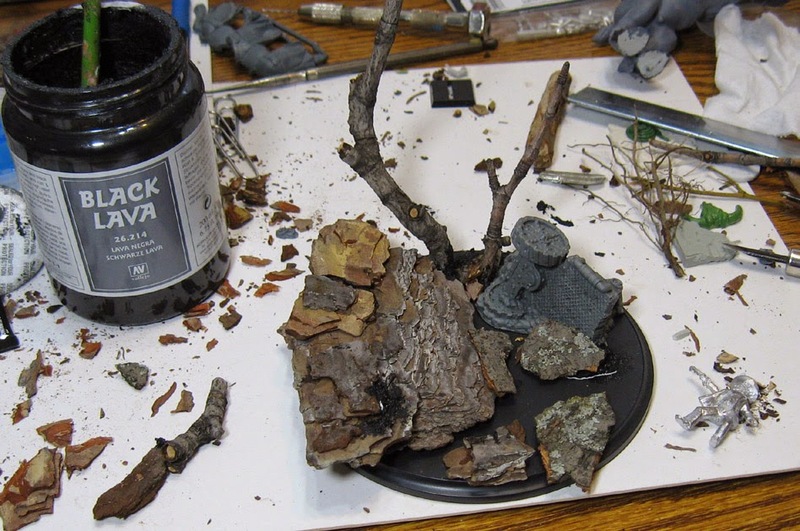 I think most of you will be able to recall the giant tree bark base that I made for the Octupus man a few weeks ago. 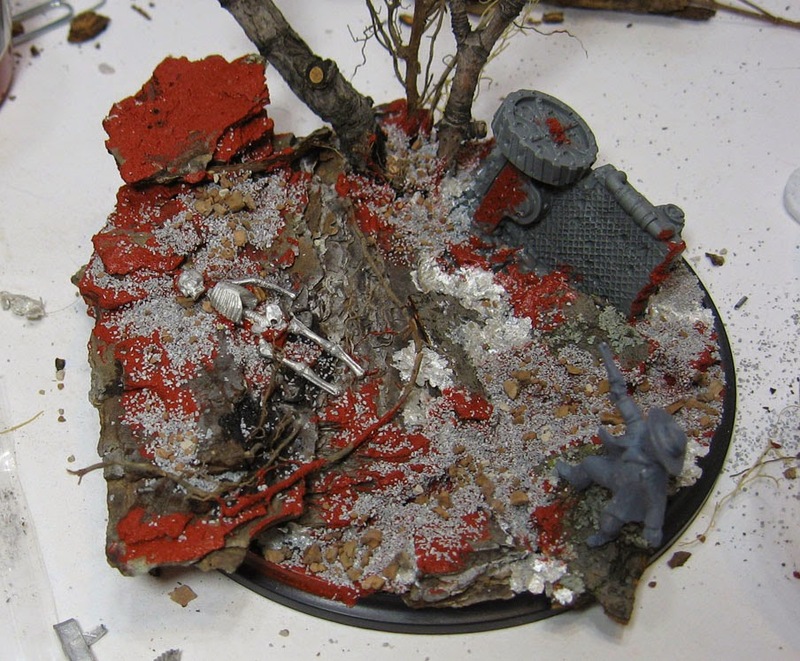 In a way, that one was just a prelude to more gigantic bases. 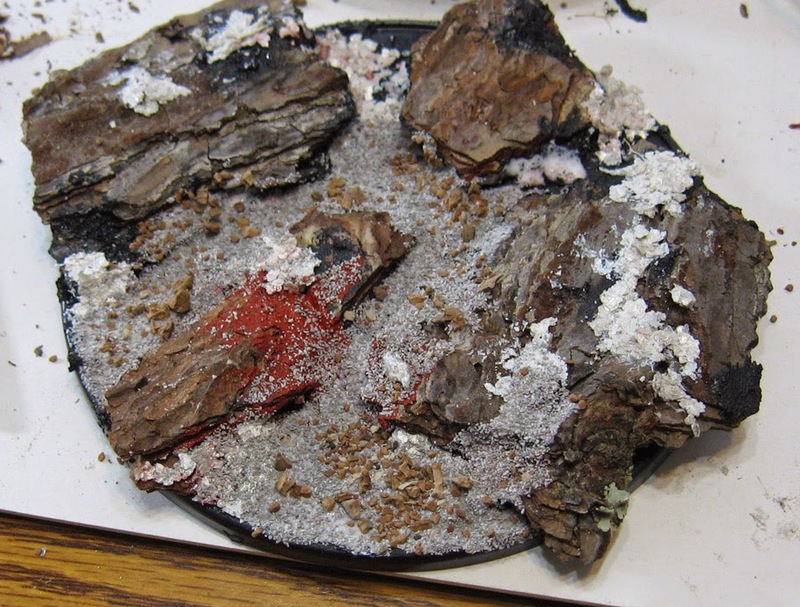 These bases are about the size of a CD or DVD. 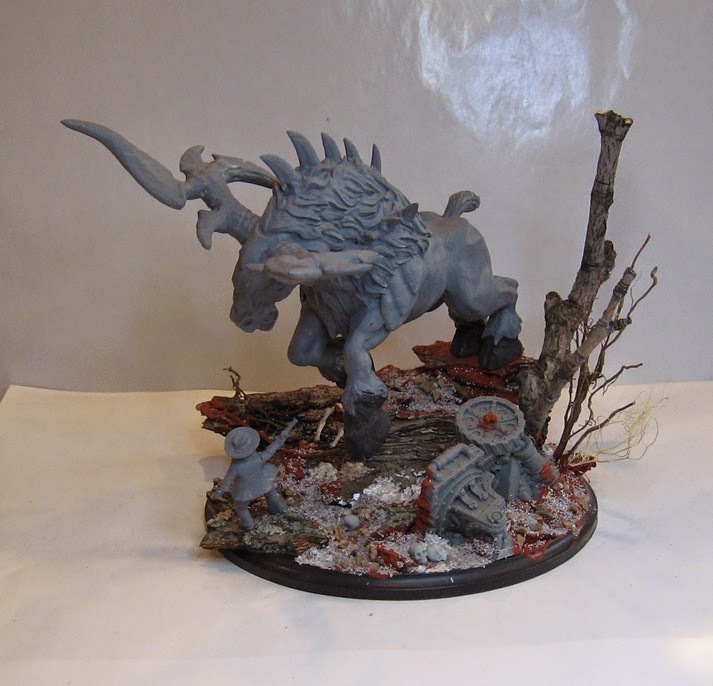 One of them was for the Great Elk, and the other was for this Mierce Miniatures giant... something. His 'footprint', such as it was, meant that it would be a big challenge. Even more so, as he hung way out over the edge of the base! This meant that my first task would be to elevate him enough so that he would not smash into regular infantry minis in close combat. 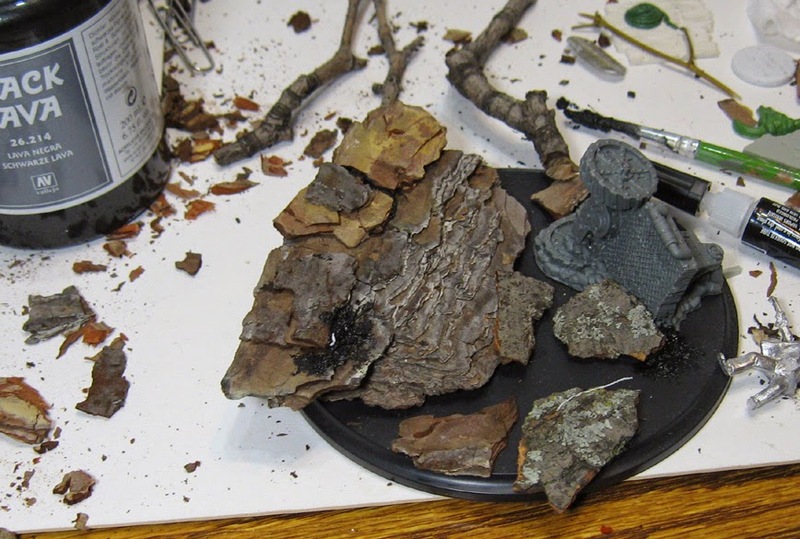 The pieces of bark also had to be wide enough to fit those massive clawed feet. I had to reposition things quite often... thinking that I had everything just right, only to see that one of the feet was hanging in the air! 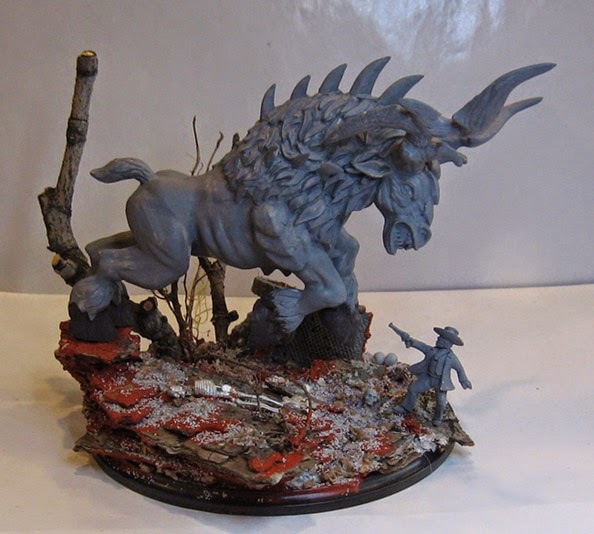 While the other huge figure did not have any such issues, my desire to create a vignette, or duel, on the base meant that I had to plan things out very carefully. 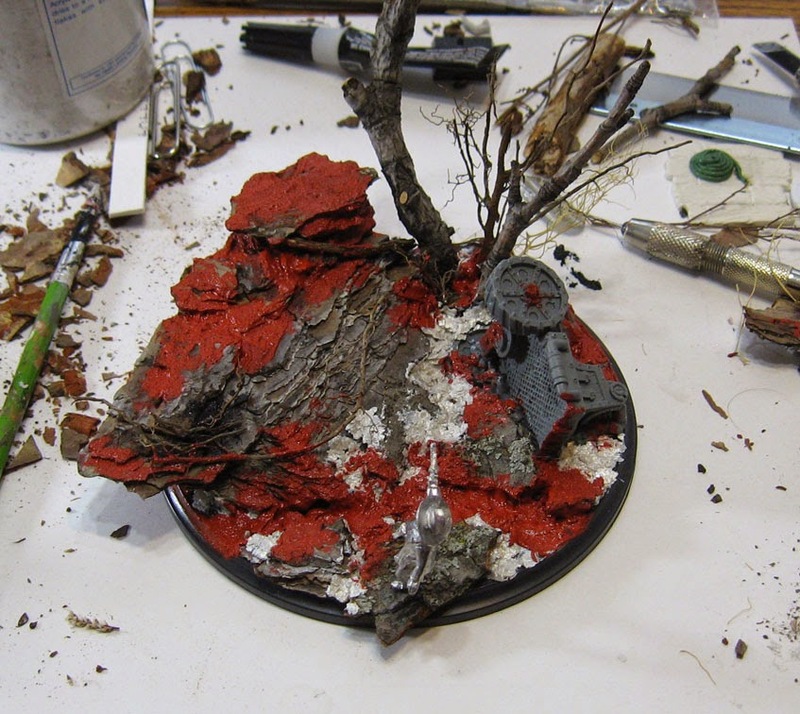 As you can see, I also wanted to utilize some wreckage from Wild West Exodus that's normally used as stand alone terrain! 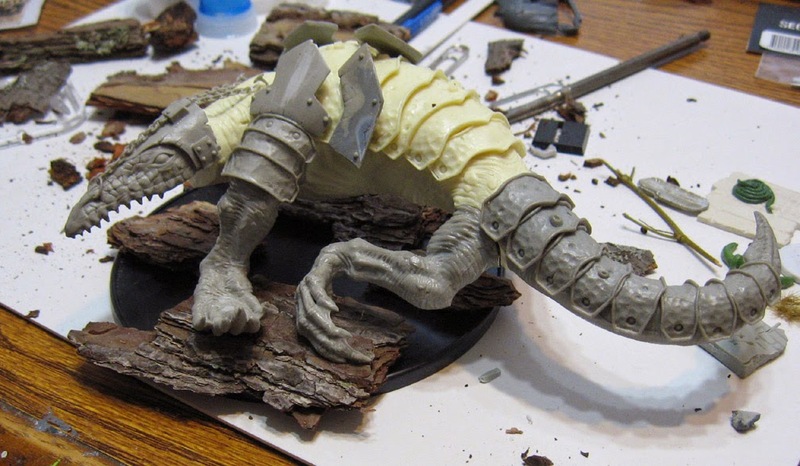 The pieces that I chose to use for the Mierce monster were made as flat on the bottom as I could make them, but to make sure there would be a more solid connection to the base, I would add some Vallejo black lava paste with the super glue. 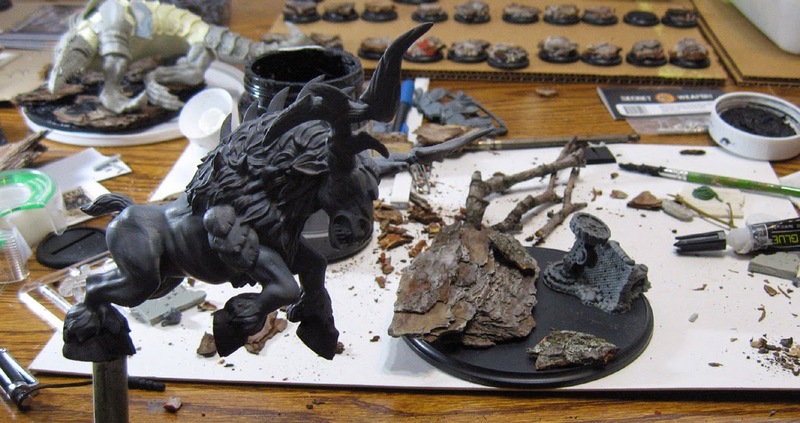 The super glue would provide a very strong hold by itself, but filling those gaps with the lava paste meant that each piece would be set in mortar, like bricks in a wall. 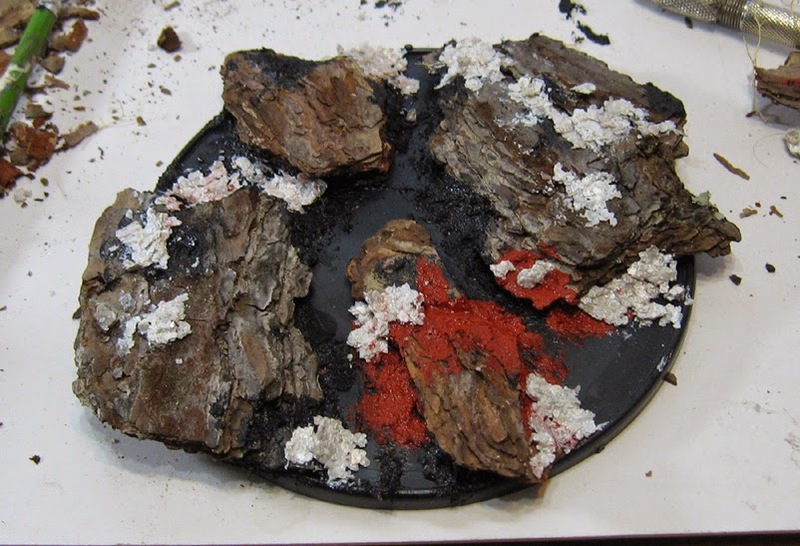 I could also fill in the surrounding areas of the rock pieces to provide some variation in the appearance of the terrain. Here's the Great Elk. Heavy, massive, solid resin. He's rearing up on those hind legs, which makes for a very dramatic pose... and hence the duel idea. 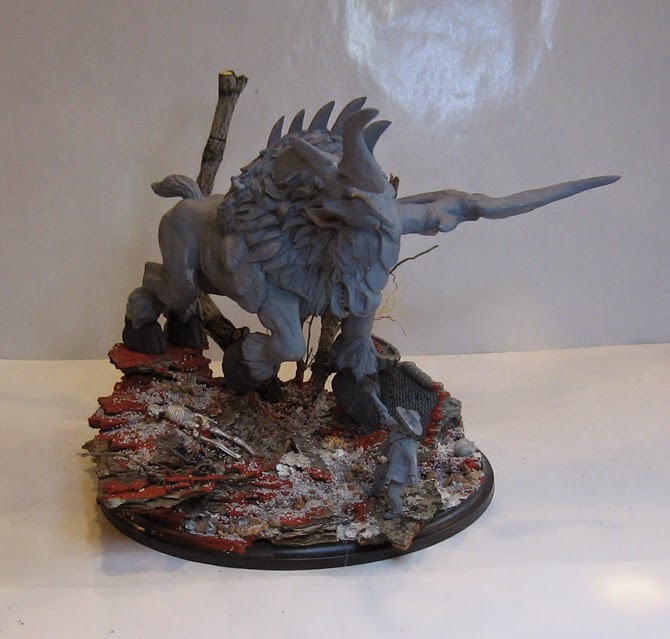 However, positioning all these things (even on a base this huge!) would not be easy. He would have to 'hang' over a precipice of tree bark. 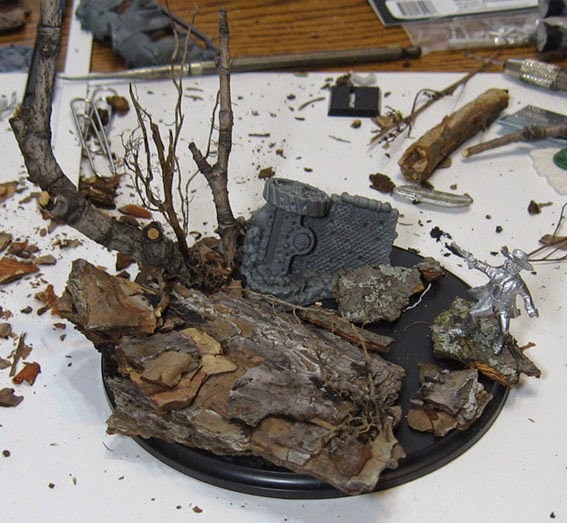 This would require the addition of many pieces of bark, and even several metal pins of 'rebar' to hold it all together. 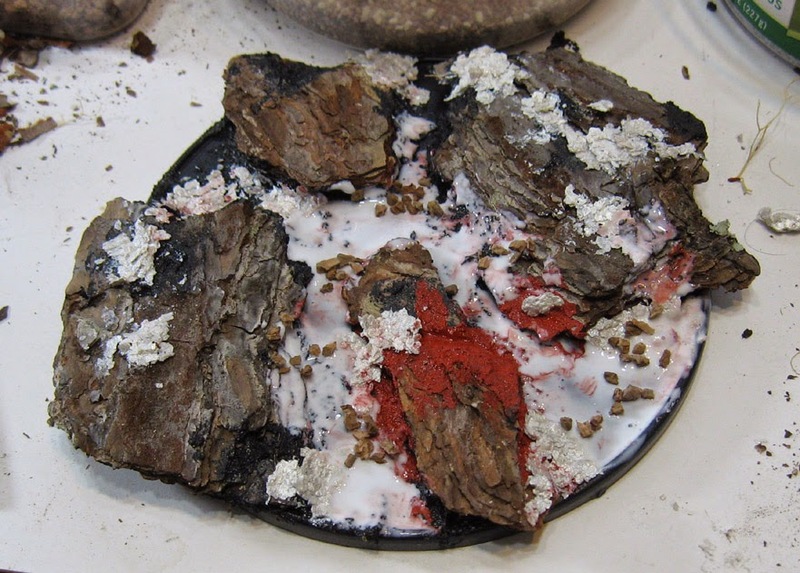 Once again, the lava paste was used like mortar to strengthen the layers of bark. As I said, strength would be at a premium here! This is still a gaming base, after all. In order to keep the base more in line with what I have been doing, some tree branches would also have to be a part of the design. 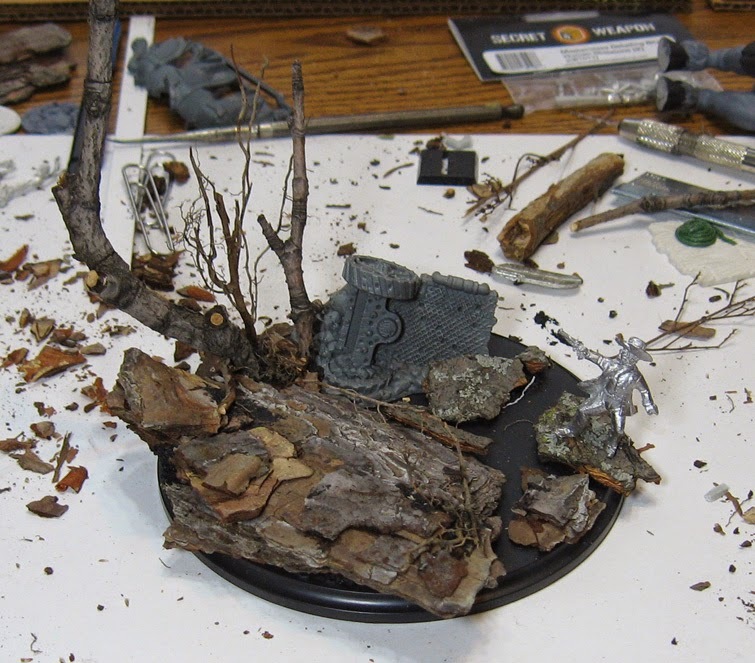 I found myself having to add more and more pieces of bark to make everything sit right. In addition to the regular style of branches, I wanted to experiment with more wispy, tangled branches. These would be far more difficult to handle, but they really lend that sense of scale. I also wanted to use some as exposed tree roots and vines. Here' s the primary attempt to position the dueling partner for the Elk. He looked like one of my lawmen, but could also be a civilian if need be. I positioned him a number of times. In the end, I had to have him angled slightly upwards. 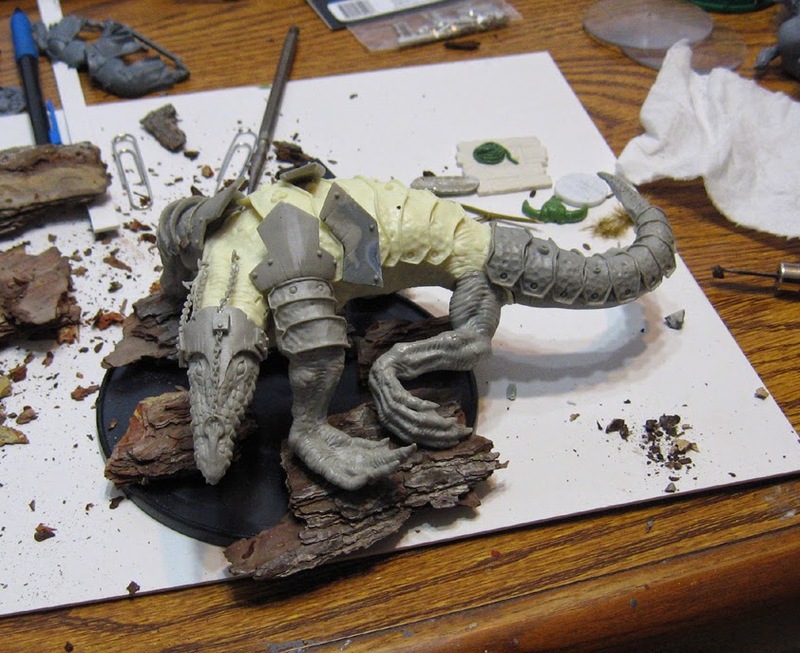 He is just temporarily pinned to the base, so that I can remove him and paint him. You can also see some of the vine type material that I used. I didn't know how it might react to being painted, so this could be a big 'teaching moment' if it didn't! Stay tuned for the next episode to find out!